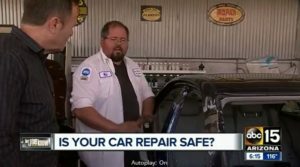 A two-part series from Arizona television station KXTV draws attention to incorrect collision repairs and advises customers on how to protect themselves from one. The “Let Joe Know” series posted Wednesday features Matt Radman of Coach Works Auto Body in Mesa, Ariz., and appears to feature the same botched 2011 Toyota Camry repair Radman posted online in 2016. In the KXTV broadcast, Radman points to a B-pillar which was sectioned incorrectly. “This could severely fail” in a T-bone crash, he tells reporter Joe Ducey. Ducey concludes that bad repairs could stem from an untrained technician’s but “more likely, an insurance company or shop trying to save some money. In part 2, Ducey advises asking an insurer for an OEM-parts-only policy, but asking for OEM parts anyway even without such a policy — the broadcast quotes Radman on some of the issues imitation parts face. Ducey also cautions customers to do their own research and not automatically go where an insurer wants, and he suggests conducting one’s own post-repair inspection of obvious issues (gaps, wind noise) and demanding an insurer pay for a professional one. It’s a pretty solid series, and it’s yet another example of how unfortunately common and easy-to-expose lousy collision work is. (It’s not subjective like “the car feels funny.” Either the pillar is cut incorrectly or it’s not.) It’s the kind of education consumers need, the kind of marketing quality, OEM procedure-following shops should be using to court them, and the kind of wake-up call sloppy shops and enabling insurers should heed before they end up on the receiving end of a similar I-team broadcast.